LOWER EAST SIDE — A commemorative 9/11 mural on the Lower East Side recently got a fresh coat of paint — and a third dimension. The refurbished “Celebrating the Heroes of Our City” mural in Henry M. Jackson Playground at Grand and Henry streets now features 3-D elements, including a fire truck and the Statue of Liberty, which appear to pop out of the wall when viewed through special glasses. 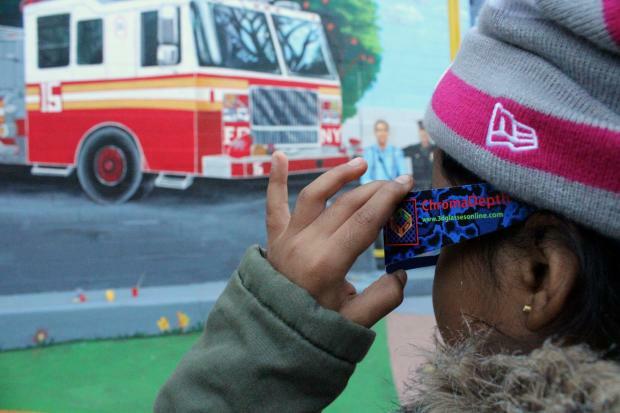 CITYarts, which originally painted 11,000-square-foot wall mural in 2002, put the finishing touches on the overhaul Wednesday with help from local kids and firefighters. “Eleven years ago, CITYarts helped the children of this New York City neighborhood respond to the tragedy of 9/11 with the creation of the mural ‘Celebrating the Heroes of Our City,'" said Tsipi Ben-Haim, executive and creative director of CITYarts. "Today, this neighborhood is stronger, this park is thriving and children have brought their hopes and dreams to a renewed painting." An issue with water coming through the wall caused the original paint to peel, and CITYarts decided to add the 3-D effects — along with images of the new One World Trade Center — while repairing the original design. Any red paint on the mural, which includes parts of the Twin Towers, the Statue of Liberty and an FDNY fire truck, jumps out when viewed through 3-D glasses. New York artist and 3-D specialist Yanusz Gilewicz led the project, enlisting the help of Lower East Side kids through local nonprofits Henry Street Settlement and Grand Street Settlement. Gilewicz said the 3-D optical illusion is created by using three layers of paint — blue, green and red. "The red comes out because the blue is underneath," said Gilewicz, who first started experimenting with 3-D paint in 1996. To make it easier for locals to view the mural in 3-D, Ben-Haim said the special 3-D glasses can be picked up from nearby stores and both the Grand Street Settlement and Henry Street Settlement headquarters.